Born and raised in New York, Ron grew up in a Reform Jewish household. Before making Aliya in 1977, Ron spent his junior year studying at Kfar Galim Agricultural HS near Haifa. Before his freshman year at the University of Albany, Ron volunteered at Kibbutz Kiryat Anavim, working as a farmer. Ron spent his sophomore year on a URJ sponsored university program at Hebrew Union College, living at Kibbutz Ma’aleh HaChamisha. In 1977, Ron received his BS in Agricultural Engineering from the University of Delaware. In October, 1977 Ron made Aliya and assisted in the establishment of Kibbutz Yahel, the first Reform kibbutz. Yahel is located in the Arava Desert Valley, the Southern Negev, considered one of the harshest deserts on earth. Ron was manager of Yahel’s citrus pomelo orchard, the largest of its kind and for years the highest producing in Israel, for twenty five years. In addition to farming, Ron is a tour guide, accompanying temple and federation groups visiting Yahel. Ron also manages the logistics for the NFTY summer group’s desert adventure sponsored by Yahel. Between 1999 and 2001, Ron served as shaliach for URJ’s Youth Division in New York. Between 2011 and 2013 Ron served as shaliach for Jewish National Fund (JNF), responsible for connecting with the Jewish Communities in TX, OK, AR, NM and LA. At present, Ron is serving as IMPJ Director of Resource Development Small Southern Jewish Communities. Ron is married to Gila, and has three children and two grand- children. Ron’s youngest child was adopted from China thirteen years ago. The Israel Movement for Reform and Progressive Judaism (IMPJ )is the umbrella organization of all Reform communities and institutions in Israel, today totaling close to 50 congregations and institutions across the country, from Rosh Pina in the North to the Arava in the south. The IMPJ seeks to promote Israel’s character as a Jewish and democratic state by nurturing the values of Jewish pluralism, social and religious tolerance, gender equality, equal rights for all, justice and “Tikkun Olam” – repairing the world. To this end, the IMPJ works in a wide range of areas, including: Education, building and developing congregations, young adult leadership, social action, Arab–‐Jewish relations, and activities for immigrants. Jewish values are the guiding principles of all the work that this IMPJ carries out. 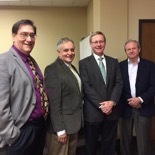 Left to right: Rabbi Liebowitz, Rabbi Ingber, Dr.Rob McCormick, & Gary Poliakoff. We’d like to thank the following institutions and individuals who have helped put to- gether this interfaith effort: USC Upstate and Dr. Rob McCormick, Wofford College and Chaplain Ron Robinson, Converse College and Chaplain Jason Loscuito, Central United Methodist and Pastor Tom Norrell, Unitarian Universalist Church and Reverend Sally Beth Shore, St. Paul the Apostle Catholic Church and Father David Whitman. We’d also like to acknowledge the follow- ing members of the religious and general community: Cheryl August, Tom & Joan Barnet, Stephen & Sandy Gordin, Jon & Cathy Lewson, Mike & Ina Minsky, Helga Moglin, Hank & Marla Steinberg, Nancy Anderson, Jay & Pam Kaplan, Dr. Dwight & Nancy Lambert, Gary & Sandy Smiley, Ben & Lynn Stauber, Gary Poliakoff, and Junie & Irene White. We are asking everyone to bring (1) one canned good to Temple each time they come. There are many in our community that	need your help. What they have in common is apparent; a time to keep warm as the shortest days approach, the emphasis on light and the never ending calories to be enjoyed and avoided. As for the themes of history they could not be more different. The Messianism in the Christian celebration is paramount, a concept that we sired but whose fulfillment awaits us still. Our celebratory theme emphasized freedom. But most distinctively it is the Jewish insistence that our uniqueness was worth the sacrifice and that our struggles to remain Jewish are to be heralded. That another message of freedom of diversity for all people has been grafted on to our holiday is worthy, but not central. The tendency to emphasize the latter as we ignore the distinctive message of being Jewish for its own sake is our loss. called Chrismakah, a false fusion of the two traditions that are not fully the same, but in some measure quite different. Other fake aspects like Chanukah tinsel is imitation of Christmas as is the so-called Hanukkah bush. The Christmas tree, to thoughtful devout Christian devotes, is filled with great meaning; the tinsel is the angel’s hair that flowed at Jesus’ birth, the star at the top is the Star of Bethlehem announcing his birth, the wreath with red berries is the future blood spilled on his crown of thorns. None of these comport with Jewish belief or practice. More than this it is usurpation of Christian holy objects which ought not to be done. I know I am in the “meaning business” and I tend to take all traditions seriously and respectfully. I appreciate Christmas, Kwanza, and Chinese New Year, but from afar. They are not my celebrations. Boundaries are important to respect. 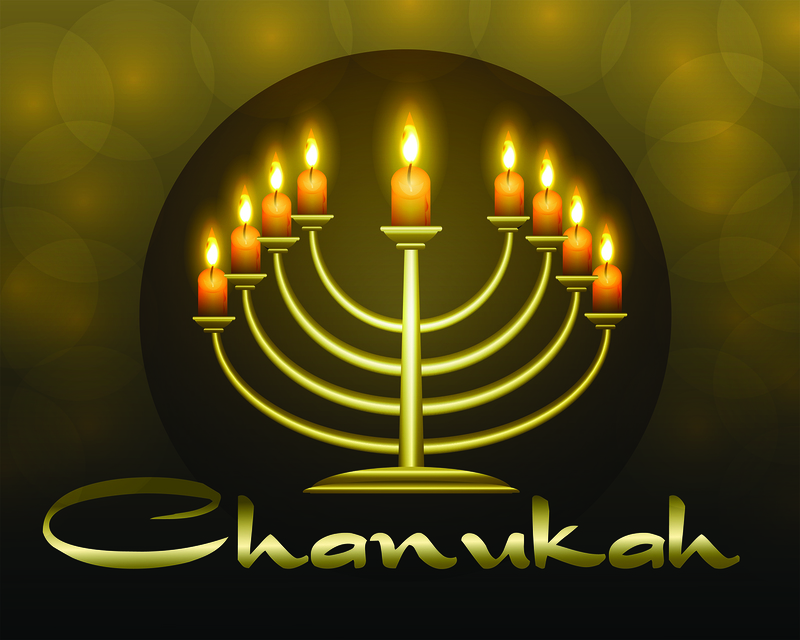 Wishing you a great Hanukkah, Rabbi Yossi Liebowitz, D.D. ‘Son of	Saul’ Offers a Truly Original Depiction of the Holocaust. In this searing drama, a concentration camp inmate tasked with burning the dead discovers the body of his young son, and must choose between participating in the clandestine uprising being planned among the prisoners, or securing a proper Jewish burial. We invite everyone to join us for a business meeting on Wednesday, November 16 at 10:30 in the Sisterhood Activity Room and stay for the Rabbi’s Brown Bag luncheon immediately following at 12 noon. Please continue to collect your loose change in your Hadassah tzedakah boxes. We will be collecting those at a luncheon meeting in December. This is tentatively scheduled to be held at Bangkok Thai. Details will be announced later. We hope everyone has a very Happy Thanksgiving surrounded by loved ones. If you are at the Temple, as a gesture toward those less fortunate, please consider bringing some canned goods for the collection barrel located in the coat closet. The need for assistance is especially great at this time of year. Did you hear the one about the Rabbi and the Pope? Catholics and Jews, A New Era!